The River Helmsdale (also referred to as the River Ullie) is located in Sutherland in the Scottish Highlands and has its source in the three interconnecting lochs of Loch Badanloch, Loch nan Clàr and Loch Rimsdale. From there it flows east south east and passes through Loch Achnamoine before turning south east at Kinbrace to flow down the Strath of Kildonan (Strath Ullie). Its mouth can be found at the village of Helmsdale where it spills out into the Moray Firth in the North Sea. Along its 21 mile (34km) course it gathers waters from a number of tributaries, including Bannock Burn on its left, Abhainn na Frithe on its right, Suisgill Burn on its left and Craggie Water on its right. Click here for a map of the River Helmsdale. One of the most productive salmon rivers in the whole of Scotland, those lucky enough to fish the River Helmsdale will have a chance of hooking a fish from the opening day of the season on the 11th January right through until the river closes on 30th September. For early spring fishing, the lower river offers the best sport as temperatures are generally low. Through February and March the runs of fish slowly increase and by the end of March and into April the occasional fish can be caught on the upper beats. The spring fishing reaches its peak in early May when the upper river really comes into play and generally continues to fish well for the rest of the summer. Grilse and summer fish can start entering the river as early as May, with the run gathering pace around the middle of June and then continuing through to late August and early September. 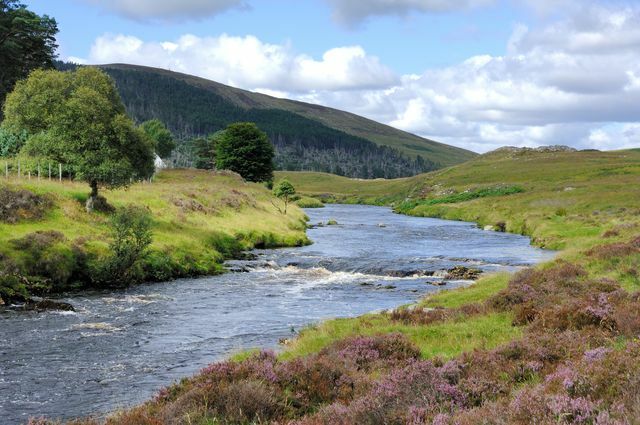 A fly fishing river only, the Willie Gunn, the Alistair and the Silver Stoats Tail are the three flies that appear to dominate the Helmsdale – the Willie Gunn being an excellent spring fly, and the Alistair and the Silver Stoats Tail being popular choices for summer fishing. Hand-tied salmon flies and excellent advice are available from the local tackle shop – click here for more information. The Helmsdale is divided into twelve beats (six above Kildonan Falls and six below) which are shared between Suisgill Estate and five other neighbouring estates, plus a 1.5 mile stretch of Association Water near the village of Helmsdale. It is rare for fishing to become available on any of the twelve prime beats, with most estates having a long waiting list in operation – click here for more information about the Suisgill waiting list. However, there are eight rods available per day on the Association Water throughout the season – click here for more information about salmon fishing on the Association Water.